Summary: The depth is still there, the acting remains flawless, and the action-sequences are more thrilling and intricate than ever. When the long-awaited adaptation of C.S Lewis’s most famous novel, The Lion, The Witch and the Wardrobe, hit cinema screens in the winter of 2005, a wave of hysteria, more often associated with the release of Potter and Lord of the Rings-style franchise, reverberated around the world. On November 17th Andrew Adamson’s sequel, The Chronicles of Narnia: Prince Caspian is released on DVD. But does the sequel really manage to live up to the hype of its predecessor? Disney’s latest endeavour, The Chronicles of Narnia: Prince Caspian opens in spectacular fashion, displaying instantaneously darker themes. The film, adapted from C.S Lewis’s beloved children’s novel, is initially fast-paced, consuming and somewhat chilling. The first few moments see us introduced to a plethora of characters, most notably the eponymous Prince Caspian himself, as he charges into the night from the depths of his aristocratic castle. The Smokey, sun-tinged picture of 1940s London, shows a strong cinematic contrast to the eerie bleakness of the opening scene. 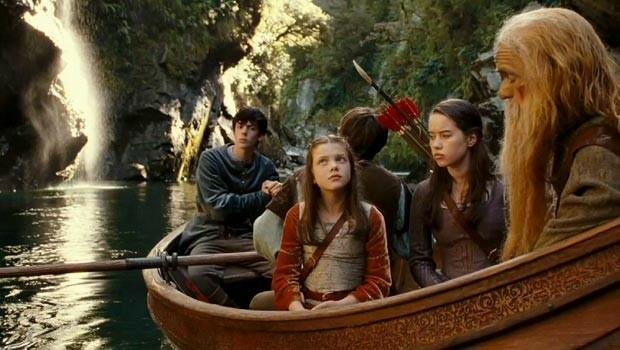 It is in central London that we are re-introduced to the primary characters of the first picture (The Lion, the Witch and the Wardrobe)—the Pevensie siblings—Peter (William Moseley), Susan (Anna Popplewell), Edmund (Skandar Keynes) and Lucy (Georgie Henley). It is one year since the Pevensie siblings have departed from Narnia. They are now living in wartime London, attending a boarding school and thinking longingly about their old home in Narnia. Having adjusted to the industrialized society, the siblings are amazed when, whilst standing on the underground tube station, they are catapulted back into the enchanting, parallel-universe of Narnia. Narnia remains remarkably beautiful and, aside from the destructions of the famous four’s home, the Cair Paravel castle, the world has seen little advancement. The siblings’ previous leadership, as Kings and Queens of Narnia, however, is now a long-forgotten myth. The land of Narnia has been invaded by The Telmarines, whose iniquitous King Miraz plans to corroborate his ruler ship by executing his young nephew Prince Caspian. Caspian, played by the rather dashing Ben Barnes, is a good-natured sought of fellow, who strongly disagrees with his Uncle’s position on the Narnians and their right to self-ruling. The film itself displays a mixture of positive and negative components. On the positive side, the stellar child cast provide some of the most detailed and watchable performances of the film. Further to this, they also share an enchanting chemistry that flows so naturally, that they quite honestly become the Pevensie siblings. The visually stunning cinematic scenery provides the perfect setting for the tale to unfold within, and adds overall magnificence to the most epic battle scenes. The CGI-created scenes demonstrate a stark and striking contrast to the natural, idyllic areas of Cathedral Cove – the special effects also lend an edgier feel to the picture. This is particularly apparent in the epos raid of Miraz’s castle, as battles transpire and treacherous blood baths ensue. This darker, edgier feel ultimately benefits the film, although I feel the price that the flick pays is a loss of the wide-eyed, magical feel that its predecessor so tenderly possessed. This has been replaced with a strong loss of innocence, which is artfully portrayed in Caspian’s physical and metaphorical journey throughout the film. Some would say that is an incontrovertibly positive aspect, and a natural progression. However, the changes will most likely result in the alienation of the original younger audience, as the dark and sometimes gruesome themes may fail to capture their imaginations. The film suffers, on occasions, from a lack of continuation. Fast-paced spectacles are followed by slightly dull exchanges between characters. The film would benefit from a greater sense of balance between action packed and slow scenes, to maintain the audience’s attention at all times, and spare drifting. The ending, whilst conclusive, feels somewhat rushed and unnatural. This may work in the novel, but it does not translate in the same sophisticated manner on the screen, and leaves the conclusion feeling incorporeal and empty. The Narnia sagas are still strong, entertaining family films that convey deep ethical and religious messages. Interestingly, however, there seems to be less focus on the theological, Christian-humanist concepts in this sequel—an area that many Narnia-enthusiasts may miss. The depth is still there, the acting remains flawless, and the action-sequences are more thrilling and intricate than ever. But the fundamental question still remains, does this stirring sequel truly live up to the sensation of its predecessor? The answer to this question is quite simple: ignore the hype surrounding the saga and you will most likely be satisfied by this entrancing, value-for-money follow-up. Be sucked in by the overly frivolous tout, however, and you may just finish the picture feeling a tad despondent.